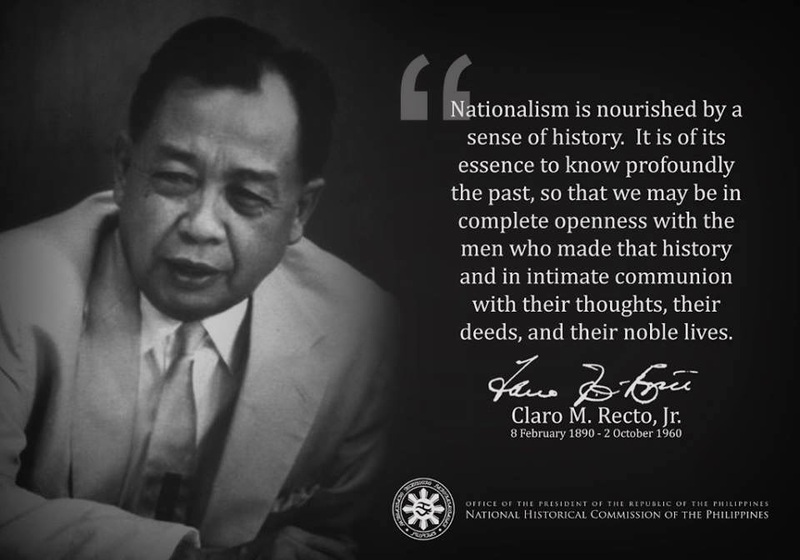 NOTE: Recto's cited examples were of his time, of course; but realities in our homeland in the present and the foreseeable future are/expectedly much, much worse. Though I am tempted to update them with current issues, it's best to leave them as they are since Recto's paradigms about our much deepened national predicament still ring relevant, valid and true. In short, Recto saw the forest and never got lost in the trees. In Part 2(A&B), he elucidated the need for economic independence: the "what, why, how, where and when" of economic independence characterized by a nationalistic outlook. He reminded us that economic independence propelled by nationalism is the sine qua non for political independence, domestically and internationally; and clarified what real industrialization ought to be. In this Part 2C Recto stressed the need to shift from being an agricultural country to an industrial country, if we were to free the native Filipino majority from perpetual impoverishment. In Part 2D, Recto strongly differentiates between "Philippines First" policy and "Filipino First" policy. In the first policy slogan, the GNP or other econometric/statistical data for the Philippines as a territory may be great but mostly benefiting foreigners, while the native Filipino majority (common tao) still continue to be mired in dire poverty; In the latter slogan, the "Filipino First" policy was designed to alter this historical/perennially distorted economic conditions and results and instead, to make the native Filipino majority the controller of and main beneficiaries of the national wealth. An agricultural economy, as that term is today universally understood, is an economy where the major, though not the exclusive, economic efforts of a nation, in terms of labor and investments, are directed to agriculture and other extractive pursuits. In such an economy, there are also a few manufacturing and service industries, but these constitute only the minor part and are mere adjuncts of the main economy. In an industrial economy, on the other hand, the case is the other way around. While there must necessarily be extractive production, the major, though again not exclusive, economic efforts of the nation are directed to manufacturing. In both, all the various sectors of production are therefore present, but they differ in the proportion of economic efforts directed to the extraction of raw materials and to the processing of these raw materials into finished products. Since raw materials, whether in the world market or in the various national markets, are always of much lower value than the products into which they are processed, it follows that the producers of raw materials always receive much less income than producers of finished products. This is likewise true among nations: an industrial nation is a prosperous and, hence, a strong and dominant nation; while an agricultural nation is a poor and, consequently, a weak and dependent nation. Industrial nations have never wanted other nations that are raw-material producers to industrialize. England tried to prevent or hamper manufacturing in America. This was one of the major causes of the American Revolution. The policy of industrializing the country should be pursued vigorously and sincerely. Many of the industries to which our administrations, past and present, point with pride as achievements of their so-called industrialization programs are nothing more than assembling, bottling, or packaging plants or concerns which import an almost finished product and merely perform the last stage of manufacturing before placing it on the selling counter. Nationalist Industrialization - Not Just "Industrialization"
I need not stress the point that when I speak of industrialization I mean nationalist industrialization, that is, the industrialization of our own economy, the Filipino economy, not merely the industrialization of the Philippines in a territorial sense. As I once pointed out in a Senate speech, foreign direct investments, as distinguished from foreign loans, not only will channel the nation's wealth into foreign lands, but will fail to promote the industrialization of the Filipino economy because it will not help in the formation of Filipino capital. When I advocate industrialization I do not have in mind, as certain supposed economic saviors of the country do, only an industrialization incidental to a general concept of economic development based on a rural economy. This concept is diametrically opposed to the views I have espoused the last five years. I advocate a real industrialization program, not one where industry would occupy a minor place in an economy still devoted to the production of raw materials for export, not a plan where industry is merely concerned with the assembly of parts or the bottling or packaging of imported products. I advocate an industrialization which would include heavy industry and from which would emanate progress in all directions, including the agricultural sectors of our country. ....Again and again, we meet with fellow Filipinos pr read remarks of Filipino commentators, that reveal an unclear understanding of the true meaning of industrialization and economic nationalism. ...When some countrymen of ours argue, and I have met many who so argue, that it would be impractical for our country to industrialize because we are by nature an agricultural country, and that anyway we do not have the wherewithal nor the technological know-how to industrialize, we who have been ardently advocating industrialism are naturally pained at such misconceptions. From the early days of the American occupation up to July 1946, it was inevitable that America should control the economic policy of our country. The American Tariff Act of 1909 establishing a so-called "free trade" between the United States and the Philippine, was a bilateral preferential free trade intended to protect American business interests in this country. Its net effect, as everybody now knows, was that, because of the immediate profits it derived from certain privileged export articles like sugar, hemp and copra, the Philippines has to this day remained a producer of primary or raw materials for export to the United States, depending entirely on the American market for said export products. Whatever thoughts of industrialization cropped up now and then were soon discouraged. That policy, whatever the intention behind it might have been, has proved disastrous to our economy. A distinguished American writer said, in the course of a general discussion of Philippine-American relations, that "as the economies of the United States and the Philippines are largely complementary, and not competitive, both countries profited but especially the Philippines." It is true that the two economies are complementary in the sense that the United States is essentially a manufacturer of finished products a portion of which is exported to the Philippines, while our country is in the main a producer of raw materials which she exports mostly to the United States. But to say that the two economies are complementary is not to say that the relationship has been beneficial to both in the same degree. In such a situation, the United States, as the manufacturing nation, has been always the gainer and the Philippines, the agricultural nation, always the loser. That is an unassailable postulate. Indeed, there is no case in history where an industrial nation was ever a colony of, or subject to, or even on the same footing economically with an agricultural country. The industrial nation has always been the dominant nation and the agricultural, the subservient. "No economist would say," according to that American writer,"that free trade with the United States for half a century has not been enormously profitable to the Philippines and of permanent benefit because it made the past progress possible." Of course what he meant was that no American economist would say such a thing. 22. Nationalism and Industrialization, July 30, 1957. 24. Short-Sighted Economic Goals, September 3, 1957. 25. The Role of Labor In Our Economic Emancipation, September 9, 1957. 26. Industrialization, the Only Cure for Our Economic and Social Ills, June 24, 1955. 27. Nationalism and Industrialization, July 30, 1957. 28. Industrialism and Economic Nationalism, October 3, 1959. 29. A Realistic Foreign Policy for the Philippines, August 18, 1956. 30. Our Raw Material-Export Economy, June 26, 1957. "This, his message, valid as it was in his lifetime, is even more timely now. For there are still those among us, devoid of sufficient faith in our potentialities, who would in their attitude and thinking, in effect reject the gospel of national dignity, national pride, and the national responsibility of self-reliance. The words of Claro M. Recto may, it is fervently hoped, occasion a change of mind and of heart." - Justice Jesus G. Barrera.